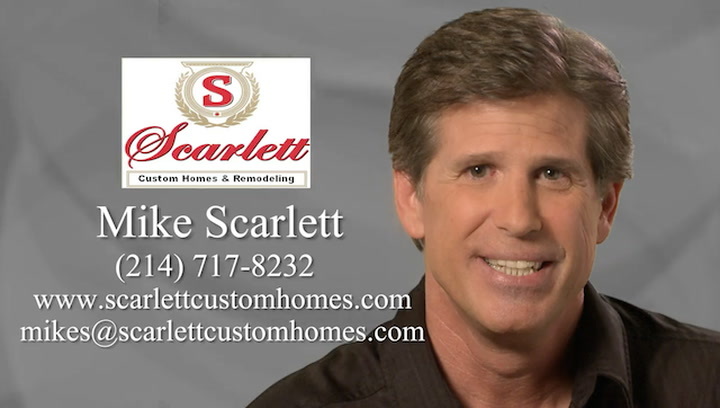 Mike Scarlett, president of Scarlett Custom Homes has been serving the DFW metroplex area for over seven years. Mike has put together a team of professionals that are able to deliver a beautiful, quality home while keeping value in mind. They have systems in place to ensure your home will be built in a timely manner and on budget using our competitive bidding process. Mike and his team are honest and are willing to go the extra mile for their clients. Mike Scarlett has been in the custom home building industry for over 30 years. His interest for the industry sparked early in 1975 where he began working for a prominent custom homebuilder in Laguna Beach, California. His knowledge of all phases of construction grew with this specific builder for a period of 10 years. It was then in 1985 that he became a licensed general contractor for The State of California and decided to begin working for himself. In addition to building beautiful custom homes, Mike Scarlett also prides himself in being a contractor who specializes in building customizable shelters and safe rooms. Safe rooms can be built to your specifications and can be designed for easy access from any room in the house. Safe rooms and shelters are becoming increasingly more popular as people want to make sure they are protected in the event of a tornado or any other natural disaster. Mike Scarlett and his team will make sure your safe room is built to include any amenities you may wants, from NBC filters, water storage tanks, blast doors and/or back up generators. Scarlett Custom homes is also able to build your shelter out of steel or concrete, they preform a soil test which allows Mike and his team to build the proper foundation for your shelter.